As part of the Open House London 2009, I was able to visit the Broadgate Tower and One Bishop’s Square this weekend. 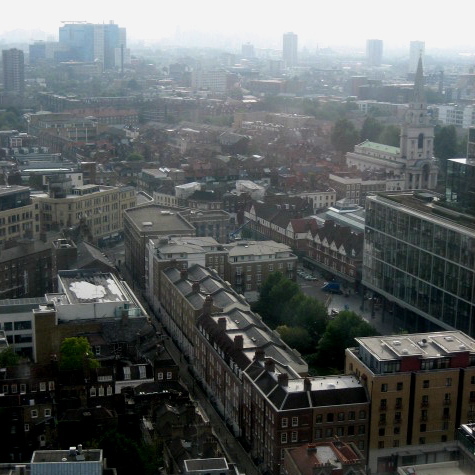 The photo above shows Spitalfields viewed from the seventeenth floor of the Broadgate Tower (half way up). I was impressed by the clarity of spatial arrangement within this building which has open floors, each occupying an entire storey without partition walls. The floors are steel, the ceilings are white and the windows create an uninterrupted wall of glass from floor to ceiling all round the building. When we reached the seventeenth floor, the entire party gasped at the spectacle of light, as we stepped from the elevator to be confronted by jaw-dropping views to the Olympic Stadium in one direction and the Millennium Wheel in the other. By contrast, One Bishop’s Square is labyrinthine and grim with a dominance of dark surfaces and sinister gloomy atriums – like some high-tech prison or private mental clinic. What a strange experience it was to walk around in the basement through the auditorium and corporate gym, in the same “space” I had once walked, years ago, through artists’ studios under the old market building that previously stood here. Regrettably, it does seem that the effort that has been taken to place this new structure discreetly within the site of the former market has resulted (in spite of its vast size) in a cramped and introverted edifice. 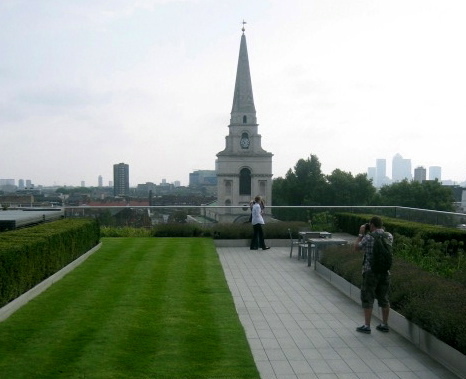 I was relieved to escape onto the beautiful roof garden planted with lavender and offering this striking perspective on Christ Church, Spitalfields .